Delicious and crunchy Cheddar cheese potato chips. These tawny gold chips are made by gently cooking potatoes to perfection in the finest oils. They are then seasoned with the freshest natural ingredients and spices, creating chips with deep, rich flavors and fresh-from-the-field character. Kettlechips are the #1 brand of natural potato chips in the United States. Made from the highest quality, freshest natural ingredients, they contain no artificial flavors, colours, preservatives, or MSG. Kettle chips are certified as kosher, gluten free and as containing no genetically modified organisms. 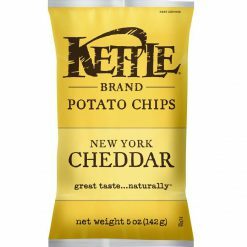 Kettle Foods, Inc. has been making great-tasting, all-natural chips since 1982. The Kettle brand had humble beginnings; the founder began selling natural food from a van in 1978. Since then, his original vision of creating great-tasting wholesome food that has undergone less processing has been the companyEEs driving ambition. In 1982, Kettle Foods perfected the first bag of Kettle BrandÂ® potato chips. Since then, the companyEEs aim has been to use only the freshest, natural ingredients to create a wide range of intensely flavoured, potato chips that customers can feel good about eating. In line with the brandEEs EEnatural promise,EE all potato chips are gluten-free and ma”ural ingredients, containing no trans-fat, MSG, preservatives or genetically modified ingredients. Ingredients: Potatoes, safflower and/or sunflower and/or canola oil, whey, salt, Cheddar cheese (pasteurized milk, cheese cultures, salt, enzymes), sugar, buttermilk powder, maltodextrin, sour cream (cream, nonfat milk, cultures), yeast extract, natural flavors, onion powder, garlic powder, lactic acid, cultured nonfat milk, spice, paprika extract (color), citric acid.